The Sudanese army has removed veteran president Omar Al Bashir from power and detained him, Defence Minister Awad Ibnouf announced on state television on Thursday. Bashir, who ruled with an iron fist since he took power in a coup in 1989, was ousted after deadly force failed to end four months of nationwide protests for his ouster. Sudanese defence minister, in uniform, announces on state TV that the military has arrested President Omar Al Bashir. Sudanese defense minister also said that the army is taking over for the next two years, suspending constitution, closing borders and airspace. Bashir will be kept in a safe place, the minister said. Sudan's powerful intelligence service announced it was freeing all the country's political detainees, state media said. The Sudanese group spearheading the demonstrations against President Omar Al Bashir urged the people "not to attack" government and private properties as they awaited a key announcement from the army. The soldiers raided the offices of the Islamic Movement, the ideological wing of the NCP, on Thursday morning, witnesses told AFP. The Associated Press has also reported the same, quoting two senior Sudanese officials. Sudanese President Omar Al Bashir is stepping down, Arabiya reports citing sources. 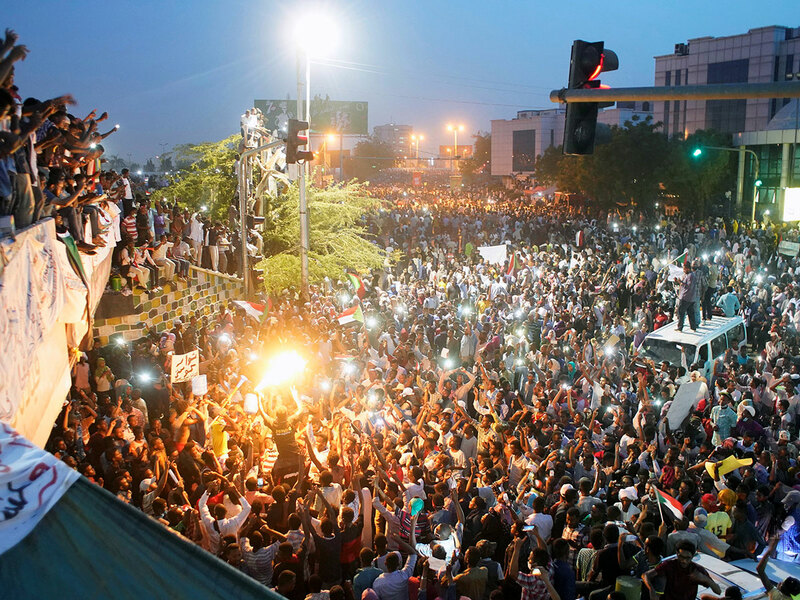 Sudan has been rocked by months of anti-government protests. Bashir would be the second leader in the region to quit amid nationwide protests this month, following Algerian President Abdelaziz Bouteflika's resignation, reports Bloomberg. KHARTOUM: Sudan state television said on Thursday that the armed forces would make an important announcement soon, amid speculation that a coup attempt could be underway against President Omar Al Bashir following months of protests against his 30-year rule. Since Dec. 19, Sudan has been rocked by persistent protests sparked by the government's attempt to raise the price of bread, and an economic crisis that has led to fuel and cash shortages Opposition figures have called for the military to help negotiate an end to Bashir's nearly three decades in power and a transition to democracy. Organisers of nationwide protests against Sudan's President Omar Al Bashir called on Khartoum residents Thursday to mass at army headquarters as state media said the army would make an "important statement". A sit-in outside army headquarters, which also houses Bashir's residence, entered its sixth day on Thursday with protesters gathered in what the European Union has described as "an unprecedented number."